Natural gas processing capacity in the Appalachian region has grown dramatically over the past several years as producers try to keep pace with increasing natural gas production in the region. Natural gas processing plays a key role in the natural gas supply chain. Natural gas processors separate dry natural gas from natural gas plant liquids (NGPL) and typically remove water, carbon dioxide, sulfur, and other contaminants, which can cause mechanical issues during pipeline transit. NGPLs—ethane, propane, normal (n-) butane, isobutane, and natural gasoline—are sold at prices higher than those they would receive if marketed at their natural gas heat value. In the Appalachian region, the increase in shale gas production since 2010 has spurred development of new midstream infrastructure, including pipelines and natural gas processing plants. Between 2010 and 2016, EIA estimates natural gas processing capacity in Kentucky, Ohio, Pennsylvania, and West Virginia has grown from 1.1 billion cubic feet per day (Bcf/d) to 10.0 Bcf/d. 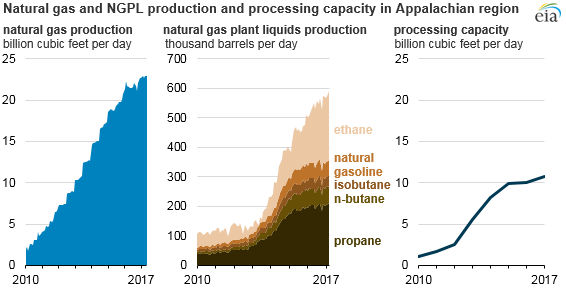 The additional capacity to process natural gas has supported growth in production of both natural gas and NGPLs, with natural gas production in those states increasing from 2.0 Bcf/d in January 2010 to 22.9 Bcf/d in May 2017 and NGPL production increased from 106,000 barrels per day (b/d) to 621,000 b/d over the same period. EIA’s Drilling Productivity Report estimates that natural gas production in the Appalachia region has continued to increase in recent months, with the Short-Term Energy Outlook expecting further growth through the rest of 2017. Natural gas processing capacity is also expected to increase by 2.5 Bcf/d over the next two years. The new processing plants being constructed use compressors and chillers to cool natural gas to extremely low temperatures (approximately -120 degrees Fahrenheit) to separate dry natural gas from liquids. These new plants can recover more propane than plants using older processing technologies and can more easily adjust their equipment to extract more or less ethane from the natural gas stream. The ability to adjust ethane extraction rates allows operators to leave more ethane in the natural gas stream, up to allowable limits set by natural gas pipelines and distribution systems, and to sell it as natural gas when the price of ethane is lower than that of natural gas. NGPLs require further processing—fractionation—to become separate, marketable products. In the Appalachian region, unlike in other producing regions, all liquids extracted are fractionated locally. 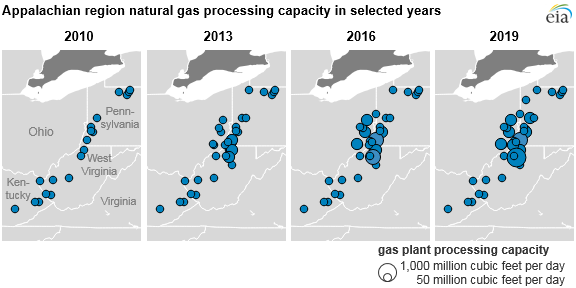 As a result, the natural gas processing capacity buildout in the Appalachian region has been accompanied by significant additions to regional fractionation capacity. EIA estimates fractionation capacity in the region has increased from 41,000 b/d in 2010 to nearly 850,000 b/d in 2016, and it could reach 1.1 million b/d in 2019. Because natural gas produced in the Appalachian region tends to contain higher amounts of ethane than in other U.S. production, natural gas processing plants in the region extract most ethane separately from the remaining NGPL stream to manage pipeline natural gas heat content. De-ethanization capacity in the region has grown from none in 2010 to more than 200,000 b/d in 2016, and it may reach 350,000 b/d by 2019. In addition to helping gas quality meet requirements on natural gas pipelines, de-ethanization capacity also helps provide supplies to meet increasing domestic and global demand for ethane as a petrochemical feedstock.